The Dragon & The Dragonfly is now available on Amazon.com! Enter your email below to keep in touch with me and receive updates on book releases and occasional newsletters. Carol Despeaux Fawcett lives in the Pacific Northwest where she grew up. She graduated from Western Washington University and earned her MFA degree from Goddard College. She is an award-winning poet whose work has appeared in many journals. 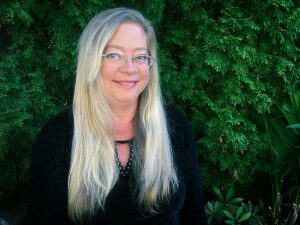 Her memoir and her poetry have won first place awards in the Pacific Northwest Writer’s Contest and her current work-in-progress, a fantasy novel, was a finalist. Her poems have been finalists in the Writer’s Digest Annual Poetry Competition, the Surrey International Writers’ Conference, and Ars Poetica. She received a poetry grant from Return to Creativity. “The Dragon and The Dragonfly,” is her first book of poetry. She co-writes www.OneWildWord.com, a blog for writers. When she’s not writing or running her health and wellness business, she enjoys spending time in nature, petting the neighborhood dogs, waiting on her two cats, riding her motorcycle, and pretending she can play guitar. 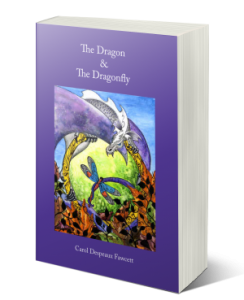 Carol Despeaux Fawcett’s first book of poetry, The Dragon & The Dragonfly, is an accumulation of her 35-year love affair with poetry. Whether she’s seeking advice from a male Tasmanian cave spider, losing herself in the spun silk of a dahlia farm, watching dragonflies skim the surface of her husband’s watery grave, or stepping lightly through a butterfly museum, her rich metaphors and sensual, precise language encourage us to find meaning in the small, everyday details of our lives. Throughout the book, the poet takes us on an intimate journey into the heart of humanity and everything it encompasses—pain, joy, loss, love, suffering, and hope. Carol Despeaux Fawcett’s poems savor the small, precise details of living, her words open “a thousand wings quivering for spring. 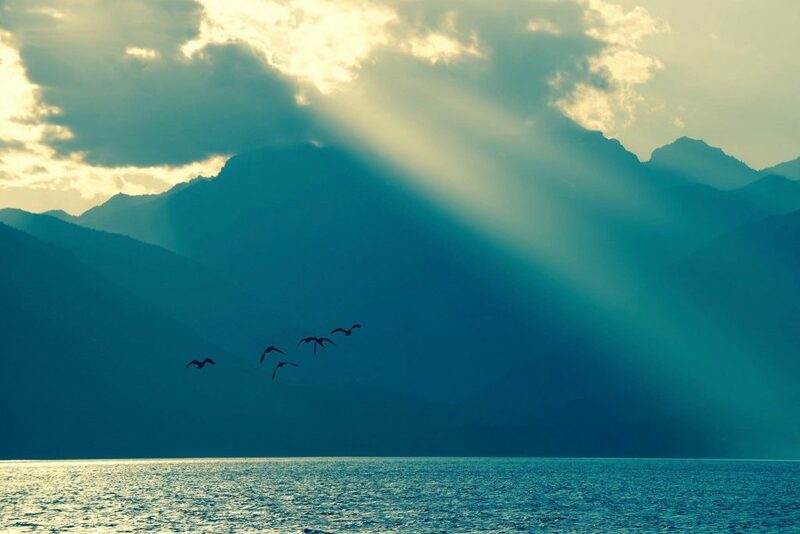 Her expressive humanity unflinchingly confronts grief and loss, yet emerges with words of celebration for this astonishing creation in which we find ourselves.” – Bill Mawhinney, author of Songs In My Begging Bowl and Cairns Along The Road. After the horrific massacre in Las Vegas on October 1, 2017, my local newspaper put a call out to area poets to help find words of healing. 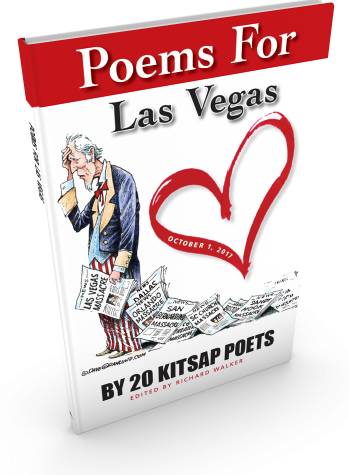 These poems are now available in a book, Poems for Las Vegas. All book royalties will go to the National Compassion Fund, established by Clark County, Nevada, and the National Center for Victims of Crime to assist the victims and families of those affected by the mass shooting in Las Vegas. I’ll be the featured poet at the Northwind Arts Center in Port Townsend, WA. cathedrals, cemeteries, Crypt of Skulls. “Sooner or later she’ll forget how to swallow. CD Fawcett’s debut urban fantasy novel is Sookie Stackhouse meets American Gods, if American Gods had angels, demons, skin walkers, and a talking cat. When veterinarian Caitlin Belle’s grandfather disappears, she returns home to the small town in the Olympic Mountains she ran from eight years before. With the help of a local sheriff’s deputy, her ex, she discovers magical beings have taken over the town—-some who want to help find her grandfather and others who want to turn her into the monster’s version of soup du jour. Accidentally freeing an army of fallen angels, she finds and heals her grandfather, who turns out to be the greatest fallen angel of all—-Lucifer. Caitlin is torn between her love for her grandfather and the responsibility of being the only person on earth who can save mankind. My granddad is the devil. I don’t mean a devil. I mean The Devil— as in Lucifer, Satan, Bezelbeb, Belial, Abaddon, Apollyan and the thousand other entirely-too-glamorous names he’s been called throughout time. Currently, he calls himself Lucian and lives with my grandmother in a blink-and-you’ve-missed-it little town on the Olympic Peninsula. Weird thing—gay marriage and pot were legalized in Washington the same year the news broke about Granddad being the devil. Thank God we didn’t live in the Bible belt. If Granddad’s claim is true, that he’s really Lucifer, then so many things make sense to me now, like mahjong tiles clicking into place. Little things. The strange, brackish hairs in the laundry. The crazy number of garden snakes in my grandmother’s flowerbeds. How every cat I ever owned always hissed at Granddad. And all those spontaneous combustions—chimney fires, kitchen fires, garbage can fires, even a recliner fire with Granddad still in the chair. Then there were the sermons he gave about God’s love for His angels. Granddad would stomp and shout and shake his fist in front of the congregation like a voodoo priest calling up the dead, his silver hair standing on end electrified. He’d lecture us on how Lucifer was God’s first and right-hand angel. How it was Lucifer’s job to play devil’s advocate to God. How he and God always got into nasty arguments over humans. How Lucifer tried to warn God about His creations but, like every parent, God didn’t want to hear about His bad children. Looking back on my childhood, other things make sense, too—how anyone who bullied me in junior high came down with chicken pox. For the longest time, I thought I was a pox carrier. Now I know I’m a carrier of something horrid, something terrifying, something far more malignant. Somewhere deep inside me, I carry the devil’s DNA. Despite my diabolical ancestry, I’ve never been superstitious. No dread of ladders. No salt over my shoulder. No fear of black cats. In fact, I consider Friday the 13th my lucky day. Good things happen to me on that day. I was born on a Friday the 13th. I was our high school valedictorian on a Friday the 13th. And, I became a full-fledged veterinarian on a Friday the 13th. So you see, that number has been good to me. Now I wonder how much my lucky number is due to my genealogy. But my luck ran out this year. Because that’s when the craziness all started, Friday, July 13th. Two days before my 24th birthday. The beginning of the end. I enjoy taking photos of the natural world around me. Living in the Pacific Northwest, I have so many incredible choices! I love to cook and create new dishes. To limit inflammation, most of my creations are sans gluten, corn, soy, and dairy. I usually provide a vegan option as well. You can find a few of my healthy recipes and creative ideas to keep your relationships sizzling (Kiss Tips) on my Facebook page Kiss the Cook. I hope you enjoy them! 5 cups pumpkin, chopped into cubes, (pick a pumpkin good for cooking that’s a little on the sweet side. I used an heirloom long pie pumpkin). Steam pumpkin cubes for about 25 to 30 minutes until done but not too mushy. While the pumpkin is steaming, heat dairy-free butter in a large saucepan.When melted stir in onion and fennel. Saute until translucent about 5 minutes. Add apple and spices. Cook, stirring frequently, until apple is soft. Stir in vegetable stock and coconut milk. Cook until heated through, stirring frequently. Add cooked pumpkin cubes. Cook for another 2 to 3 minutes, stirring frequently until heated through, allowing flavors to blend. Pour mixture into a Vitamix or large blender (you can do two batches if you have a smaller blender) and blend on high until smooth. Kiss Tip: For a special occasion—birthday or anniversary of any kind—give your partner a small box or tin with little notes inside explaining why you love them. Use a combination of your words and other people’s quotes about love and friendship. You can create this over time or all at once. (Hint: over time is more fun because you get to savor your relationship and gratitude for the other person). Are you looking for a jolt of inspiration, a new way of approaching your writing practice? Maybe you’re stuck on a scene or looking for a way to describe the nuance of a character. Sometimes all it takes is one wild word to make a poem sing or a sentence fly. In that spirit, we’ve created this blog in hopes you’ll find a dose of wild writing mojo to fuel your next sentence. Writing tips and inspiration for the creative life. Online courses for writing. Margie has changed my writing life! Great website and book by Shawn Coyne on how to write a successful novel. A list of different blogs available from WD. Great advice and writing tips. How to revise query letters so they actually work. Good advice and tips for writers. Articles on writing and wellness. Advice for the fiction writer. Great interviews and many contributing authors. Copyright © 2017 Carol Despeaux Fawcett. All Rights Reserved.